So you took our advice in our last blog and found that perfect employee (or two). Now, how are you going to keep them on your team? Invest in your people from their first day in your restaurant. Employees want training opportunities. Research shows that restaurants who provide 4 or more hours of new employee orientation have lower turnover rates that those who provide less. If workers don’t feel that they’re developing in their jobs, they’re more likely to leave. If people feel like they have a future at your place, they’ll stay. Having a well-conceived training program not only increases the efficiency of your staff, but it also encourages them to work as a team. Investing in technologies will help your employees be successful and companies that offer technology and systems training have a turnover rate 20% lower than companies that don’t. Restaurant employees are looking for technology that lets them trade shifts, from their cell phone, without having to go through a manager. This will allow your team to achieve the work/life balance they crave. Using a system like HotSchedules will help you create schedules 75% faster, allow your employees to swap and pick up shifts and request and approve time off. A Point of Sale (POS) system is another restaurant technology that will have a positive effect on your employees. 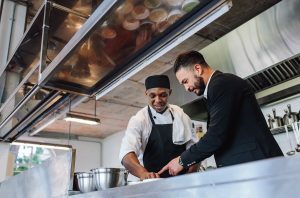 Restaurant employees have a range of jobs to juggle and a POS system will take the pressure off both front-of-house and back-of-house employees. Not having to worry about ingredients running low and explaining to customers that items aren’t available, being able to split a check evenly just by hitting a few buttons, sending an order back to the kitchen and your host being able to seat customers and distribute tables efficiently and equitably, all are ways a POS will help your employees keep the stress levels down. Encourage involvement. Brainstorm with your employees on how to solve problems, come up with new menu trends, developing a trendy cocktail. Workers who feel vital to your success stay engaged and help them take more ownership in your restaurant and overall performance. Share positive feedback. Did your customer rave about that deliciously perfect-temp cup of coffee this morning along with fantastic service? Letting your employees know they someone’s day makes them feel good – and gives them a deeper connection to your business. Work together. Don’t allow your employees to utter “that’s not my job”. Foster a “we’re in this together” attitude by promoting mutual responsibility. Don’t ask your employees to do anything you’re not willing to do or have done yourself. Make your restaurant a pleasant place to be. Having a fun place to work makes work a lot more pleasant. Organize contests to earn extra cash or offer incentives like free food. Health Insurance. It’s a necessity that is not always affordable. However,the National Restaurant Association and United Healthcare have teamed up to make it more available to restaurants and its employees. Vacation Time, Sick Leave and Paid Time Off. This is not a benefit enjoyed by many employees in the restaurant industry. Make your restaurant stand out by offering this simple benefit – before it’s a mandate. Employee Assistance Programs (EAP) can help employees with counseling, wellness, and other issues. “Angel Funds” are benefits programs that can assist employees and their families by providing financial assistance to employees suffering from hardship. NMRA’s Hospitality Industry Education Foundation is setting up just such a fund that will be fully functional in 2019. Your restaurant can participate. Check it out here! 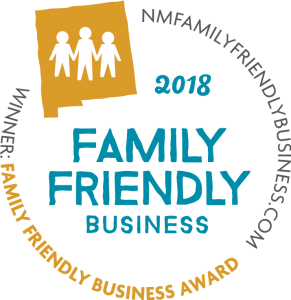 Do you know about the Family Friendly Business Award? 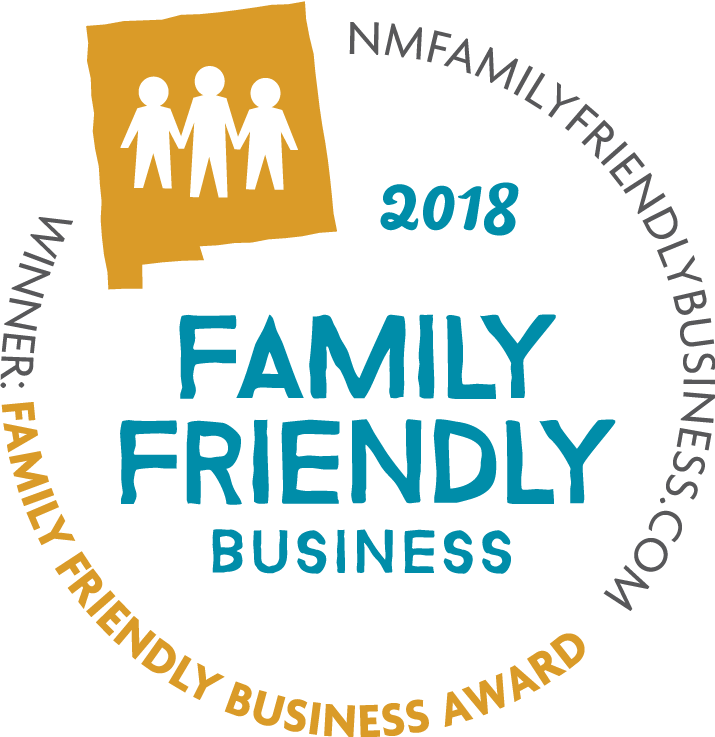 The New Mexico Family Friendly Business Award was formed by the Task Force on Work Life Balance to develop an awards program that would both recognize New Mexico employers and businesses that offer family friendly employee benefits and promote increasing the number of businesses with family centered policies and workforce access to them. The purpose of the award is to recognize and support businesses that adopt and implement family friendly policies for their employees. We took home the Gold Seal for 2018! Will your place be next? We gave you the tools, now go take care of your employees! Stay tuned for the powerful live webinar on Wednesday, October 17th with Roger from Restaurant Rockstars as he shares his 3 secrets to building your Dream Team even in tight labor markets. This webinar will teach you successful staff recruiting, team-building and effective training. Spots fill quickly, sign up today!